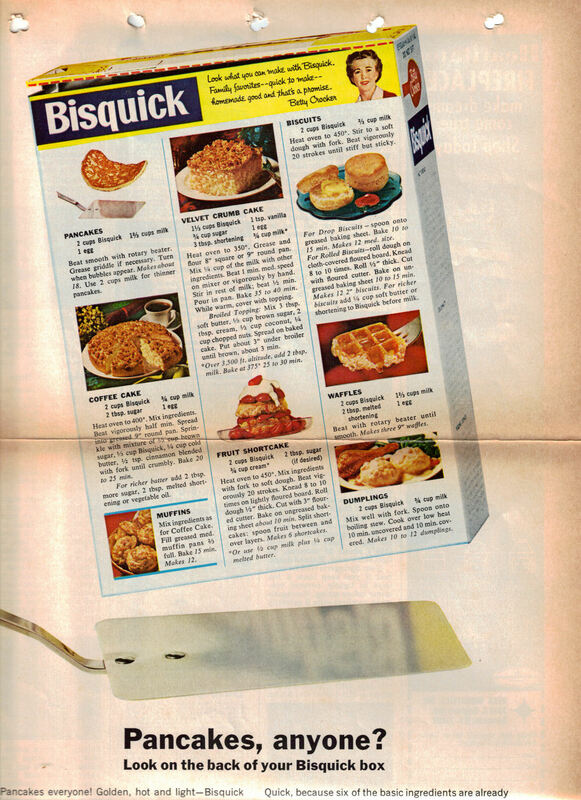 This is a full page recipe advertisement for Bisquick listing 8 different recipes you can use with Bisquick. It was published in a magazine dated 1964. The entire page is typed below along with a scanned copy, click to view larger if you like. The page size is a bit too large for my scanner so part of the bottom is missing. Beat smooth with rotary beater. Grease griddle if necessary. Turn when bubbles appear. Makes about 18. Use 2 cups milk for thinner pancakes. Heat oven to 400°. Mix ingredients. Beat vigorously half min. Spread into greased 9″ round pan. Sprinkle with mixture of 1/3 cup brown sugar, 1/3 cup Bisquick, 1/4 cup cold butter, 1/2 tsp. cinnamon blended with fork until crumbly. Bake 20 to 25 min. For richer batter add 2 tbsp. more sugar, 2 tbsp. melted shortening or vegetable oil. Mix ingredients as for Coffee Cake. Fill greased med. muffin pans 2/3 full. Bake 15 min. Makes 12. Heat oven to 350°. Grease and flour 8″ square or 9″ round pan. Mix 1/4 cup of the milk with other ingredients. Beat 1 min. med. speed on mixer or vigorously by hand. Stir in rest of milk; beat 1/2 min. Pour in pan. Bake 35 to 40 min. While warm, cover with topping. Broiled Topping: Mix 3 tbsp. soft butter, 1/3 cup brown sugar, 2 tbsp. cream, 1/2 cup coconut, 1/4 cup chopped nuts. Spread on baked cake. Put about 3″ under broiler until brown, about 3 min. *Over 3,500 ft. altitude, add 2 tbsp. milk. Bake at 375° 25 to 30 min. Heat oven to 450°. Mix ingredients with fork to soft dough. Beat vigorously 20 strokes. Knead 8 to 10 times on lightly floured board. Roll dough 1/2″ thick. Cut with 3″ floured cutter. Bake on ungreased baking sheet about 10 min. Split shortcakes: spoon fruit between and over layers. Makes 6 shortcakes. *Or use 1/2 cup milk plus 1/4 cup melted butter. Heat oven to 450°. Stir to a soft dough with fork. Beat vigorously 20 strokes until stiff but sticky. For Drop Biscuits–spoon onto greased baking sheet. Bake 10 to 15 min. Makes 12 med. size. For Rolled Biscuits–roll dough on cloth-covered floured board. Knead 8 to 10 times. Roll 1/2″ thick. Cut with floured cutter. Bake on ungreased baking sheet 10 to 15 min. Makes 12 2″ biscuits. For richer biscuits add 1/4 cup soft butter or shortening to Bisquick before milk. Beat with rotary beater until smooth. Makes three 9″ waffles. Mix well with fork. Spoon onto boiling stew. Cook over low heat 10 min. uncovered and 10 min. covered. Makes 10 to 12 dumplings. Pancakes everyone! Golden, hot and light–Bisquick pancakes. Easiest pancakes to make, too. Add milk and egg to Bisquick–Betty Crocker’s own recipe. Quick, because six of the basic ingredients are already measured and blended for you in Bisquick. Try this shortcut to a pancake breakfast some morning soon! Thanks so much for putting these recipes up! I do wish the companies would archive all their old recipes, so we would not lose the tried and true. As for the “Fruitcake” I’m assuming JA is referring to what we called short cake. My mom didnt knead the dough, I think she just plopped big globs of the stiff batter on the cookie sheet, and baked as directed. Pretty sure she used the same –erhm, “technique” when making the biscuits. The only smooth biscuit she ever made popped right out of the Poppin Fresh blue cardboard can. Canned Biscuits! Ew. I am looking for the recipe that used to be on the Bisquick box – it was ground beef with cream of mushroom soup rolled up in Bisquick that had been rolled out. It was topped with cheese and cream of mushroom soup. I AM LOOKING FOR BISQUICK ORIGINAL BOX RECIPE FOR THEIR PLAIN BANANA BREAD!!! IT WAS ON THE SIDE OF THE BOX.I LOST MY LITTLE CARDBOARD RECIPE OF THIS!! THANKS TO ANYONE WHO HAS IT!